This is a simple drive to near the end of San Andreas Drive. You’ll see the trailhead right next to the road, and all parking is on the road. When I went, there were several cars parked on the road, but still quite enough room for many more cars. We did the exact same route as last time. It’s mostly exposed fire roads, so a little bit on the hot side if temps are high. But when we did this hike, it was around 75F, so not too bad. As with last time, I was accompanied by my sons. We had our (almost) 13-year-old dog, Tashi with us. And Obi, our other dog that’s around 8 or 10 months old. They didn’t like the sun so much, so they were pretty relieved to reach the few sections with shade. Actually, we were all relieved. It was pretty hot in the sun. Once we arrived at the top, I looked for a place to set up the hammock for the boys. It took me a few minutes to find a spot that didn’t have poison oak. As it was, I had to tell them not to stray too far behind the hammock. 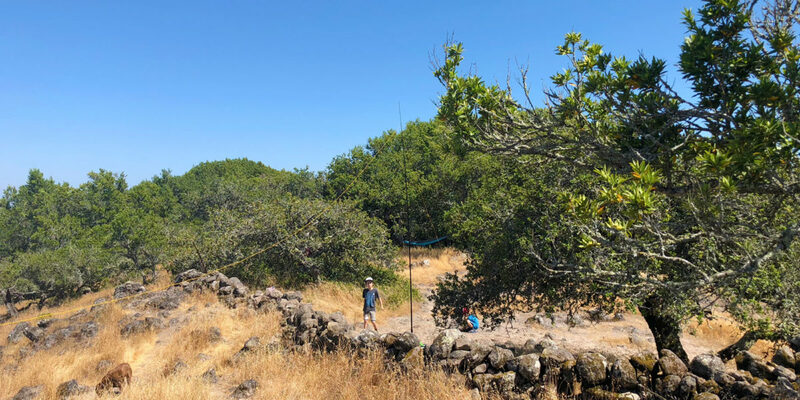 Next, I set up the antenna pretty much as I had done before, with a little twist – I positioned the near end so that I’d be able to sit under the shade of a tree, instead of hanging out in the sun the whole time. I had a good view of the hammock and surrounding area during the activation, which made it easy to keep an eye on my boys and the dogs. The activation went pretty smoothly. I worked several contacts on 20 meters CW, then switched to SSB and got a few more. I then switched to 40 SSB and got one, then CW for a few more there. With the activation all done, I snapped some photos, including this one of all three of us. After I got all packed up, I figured I’d give 2 meters a try. I made one contact there as I was walking off the summit. Right after that, I noticed my older dog, Tashi, wasn’t doing so well. I actually ended up having to carry her most of the way back down to the car. She ended up being fine, but I think she might be getting too old for summits (at least in the warmer months). ← Previous Post W6/SC-261, Pinyon Peak – Success!